“On a certain night Jim, Mike, Ron and Dave died. Shortly thereafter they all found themselves walking on a beaten path. It seemed right to follow the path. Finally they came to a dividing point. One path veered to the left; the other to the right. They stood a moment, pondering what to do, when suddenly a man in white appeared and gave them instructions. “After saying this the man disappeared. The four were astonished at this somewhat random method of reaching Heaven or Hell. Finally, they decided they must go forward and drew straws to determine who would go first. Jim got the first opportunity and chose the path on the right. He thought that perhaps this would lead to heaven because the “right” is always associated with “good.” But as he proceeded he heard the fierce sound of wild animals, clouds seemed to hide the sun and the earth shook. He became very frightened and thought, ‘Maybe I have chosen the wrong path.’ He turned around, went back to the beginning and told the others of his experience. Then he decided to try the left hand path. As he ventured forth he saw more ominous signs. He kept wondering how far he could go before he could not turn back, and ! with each step he became more and more frightened until he was forced to retreat back to the beginning. “It was now Ron’s turn and he said, ‘I’m picking the right-hand path and not turning back.’ He followed through with his decision, and went past the sound of wild animals and through the darkness and storm clouds until he found himself in a place of unspeakable beauty and peace. He assumed he was in Heaven and rested there. “As he proceeded, things went from bad to worse. There were horrific shrieks from wild animals and storm clouds with fierce thunderbolts were everywhere. Still, he proceeded until he reached a sign that said ‘Hell”. Behind him, the path disappeared and there was no retreat. Before him was a depressing place, dark and stormy, full of inhabitants living in run-down shacks. The people lived in constant fear of attacks from the animals and roaming gangs who stole whatever they could get their hands on. Everywhere he went he was told this was a land cursed by the devil, and that things are going to get worse for all eternity. “From that point on, Dave went forth in confidence and taught the people that they did not have to live in the run-down shacks, and that they could change their circumstances so they would not have to live in fear. He also questioned their belief the land was cursed by the devil. A handful of people took hope and listened, but the rest were afraid and even looked upon Dave as an enemy, fearing he would make things even worse than they were. “Dave gathered the people who would listen. They refused to accept the slum they were given as a final resting place and made blueprints of new beautiful homes. The best land they could find was an uninhabited swamp. They drained it and built their homes and a beautiful city with teeming gardens and landscapes. The gangs did not bother them, for the inhabitants supported and protected each other. The wild animals became friends, for the people nurtured them. Even the dark clouds and storms began to subside and bright, sunny days became a common sight. “The people who were against Dave saw what had been accomplished and they took courage; one by one, other parts of Hell became transformed into beautiful cities and landscapes. After a period of time there was nothing but beauty and peace as far as the eye could see. “Dave surveyed the now-beautiful land and came to a realization: One more thing needs to be done. He walked over to the original entrance and found that old sign which read ‘Hell’, tore it down, and replaced it with one that said ‘Heaven’. As he did, another path with a fork in it appeared and so did the man in white. His look caught Dave’s eye and he said, ‘I think you know what you must do’. “Dave looked back and said, ‘I see I must choose again’. “The man answered: ‘Ron is in a city that resembles the place you have created. He has one regret: he wishes he had a part in creating it. When that desire becomes strong enough he will be given another path to choose and will wind up in a place called ‘Hell,’ as you did, and be given an opportunity to build Heaven. “Jim and Mike are still paralyzed with fear, afraid to make a decision. They are the ones who are truly in Hell, yet sooner or later they must proceed onward. “And what lies ahead for me?’ asked Dave. “The unknown’, said the man. If you have come to a complete wall on what to do next, is it a good idea to fast, prayer and meditate on your next step? This is a problem all of us have had from time to time. Even super human lives reach an impasse now and then and do not know which direction to take is the better. One can understand why this would happen to the average person, but why would it happen to even the masters and beyond? The answer is simple. All of us, high and low, are learning and we learn best by experience. Our next step in learning has many unknowns in it. You do not learn if you already know all there is in a certain area. The fact that we are ever learning tells us that all of us are attempting to discover the unknown and make it known. This creates a problem for all us all now and then, but it is a good problem. If we didn’t have this problem then it would mean there is no more learning and if there were no more learning there would be no purpose and without learning and purpose there would be no creation and without creation all life would dissolve and we would all be as if we never were. So, what do the masters do when they reach an apparent dead end and are not sure of their next step? They do the same thing that we have to do. They stand still for a period of time and think about it. They do however, ask themselves a question that is often overlooked by average humanity which is this. They assess all the things they should have accomplished with what they know and ask themselves if there is any more work that needs done before they take their next step. If the answer is yes then they understand that there may be a few things they yet need to do before a next step is possible. So, when the disciple has done all that is possible to prepare for the next step and the next step is still unclear, then what? For inspiration on this go back to the Parable of Decision in the first Immortal book. There we see an example of the wrong thing to do. The two who could not make a decision suffered the most. The other two who took the two paths were both far ahead of those who stood still in fear. If one does not know what to do then he must use the first Key and Decide – decide something even if there is a good chance the decision is wrong. If the decision is a bad one the error in it will reveal itself as you move forward. Then you can see more clearly and make a good decision that was impossible earlier. It is imperative then that we make a decision and then force ourselves to act upon it. Always try and incorporate the principle of harmlessness into that decision. I have read extensively on soul contact yet have never experienced it. I feel hollow and am struggling. I remember your writings on life cycles and how if one does not find his purpose by age fifty, a self-destruct mechanism activates and ends the life. Part of me wants to let that mechanism activate and another part of me wants to cross the finish line victorious. I feel paraplegic in my attempts to see the purpose of this incarnation. I am obviously doing something wrong but not sure what. You are referring to the age of crystallization and that is 54-56 years. They do not self-destruct, however, but just take it easy on the learning curve for the rest of their lives. About 90% of humanity gets caught in this trap. Many people are under the illusion that God has some complete plan for them and they must discover it. They often wait in vain. Why? Because most of us have to develop our own plan. Every once in a while a disciple will receive a revelation on what do to next but most of the time it is up to us and the sky is the limit. We can do whatever we want. So ask yourself. What type of work do I enjoy. Then learn some more things around that which you enjoy and apply them or teach them. This will give you purpose. Also ask yourself – what new thing can I learn that would be fulfilling? Then set about to learn that thing. In the process of all this look back upon your life and ask yourself if there was any message from your inner self that you ignored and have not acted upon. If there was and you know it then retrieve that guidance and act upon it. This act can restore purpose very quickly. 1. Where there is no decision there is no life. 2. If the future is set then there is no power of decision for there would be no decisions to be made. If there are no decisions then there is no life for the power of decision is the principle behind life. 3. The direction of an intelligent decision can often not be predicted in advance. An intelligence coming to three paths of equal value will often pick one for reasons that even it did not know in advance. 4. If one wants to accomplish beyond the norm he must not only believe but make a decision within his ring of consciousness. 5. The reward of God is here for us now awaiting our decision to accept. 6. There is a power within you that makes the actual decisions. The Decision itself is not you but is an effect proceeding from you. What is the real you is the essence within you, the operating self existent power that makes decisions. This power of decision and decision are two different things. Through this essence all lives are one and that oneness becomes realized when we obtain full use of this power through the assumption of our real opportunity to make decisions. 7. If you endure a bad situation in silence because you have made a mental decision to accept it then you have not given away your power. 8. If you are true to yourself and have the courage to face your own power of decision, you will come to a knowledge of how you will react in any circumstance. 9. Free will involves more than just living in a situation where you are not restricted from the outside. More importantly, it involves a decision to decide and take responsibility for your life. 10. We all seek to improve our conditions with each decision we make. 11. Guilt is a negative force that focuses Attention on your imperfection and paralyzes your power of decision. 12. It is only after a decision has been made that Purpose is made manifest even though they both silently co-exist in the mind of the Creator. Then it is only after a purpose is sensed that Power can be applied. Again it is only after purpose and power is in play that Will can be exercised to manifest the decision. 13. True hell, as pointed out by the Parable of Decision is being at a crossroad and not being able to decide upon a path and standing still with fear of failure. 15. The Workers of Light must not yield up the decision making power going into the coming world order to others or we will wind up being controlled by others. 16. Will cannot exist without decision for Will is a motivating force to bring that which has been decided into existence. 17. There is no waiting. As soon as you make the decision to move ahead you begin your journey, Photon Belt or no Photon Belt, extra DNA or no DNA, 5th dimension or no fifth dimension. All creation awaits your decision, and your decision comes when you decide and you decide when you realize that there is nothing outside of yourself to wait upon. 18. While it is true that there are some things that are supposed to be, because they have already been decided, there are many things not decided in advance that happen just because you made them happen. 19. Because we are decision, this puts many elements of the future in a state of flux. The only thing that is not in flux are those things which have already been decided. 20. God’s Will is in all decisions either through choices, or through using our agency to choose. 21. If a thing is predetermined it means that there is no free will involved, no real choice is available. 22. While it is true that much indecision is caused by fear there are many who are indecisive for reasons other than fear. A person can be indecisive and have no fear as a cause, yet there is no fear that can stand in the way of a powerful decision. 23. If you put two paths before an animal and the choice is not related to his instincts, you will then see an elementary unpredictable decision made. 24. There are times when you are faced with a choice between the real and the unreal, what is true and what is false. When faced with such a choice you seek the truth within your heart. In this case, there will be a sense of peace surrounding the truth, and fear connected with the false. 25. You can create or decide anything you want to. Each creation is a DECISION point, but decisions in time and space cannot be changed. 26. All direction is created by DECISION and all DECISION originates from some Life. 27. The only future which is a sure thing is that which is the result of a decision made by an entity with power to bring the decision to completion. 28. It is the removal of restrictions either imaginary or real, so the power of decision has complete freedom within the sphere of its plan. 29. When a fellow friend is in trouble we, of course, want to give advice and I probably give as much as any but one thing we must avoid is being offended if our advice is not taken. It is the person who is in trouble who has responsibility for the final decision and this decision must be respected, right or wrong. 30. Decision, which has no cause but is cause and eternal, originates cause that creates. Decision originates new cause. 31. He who follows the harmless path seeks to do harm to no living thing, but realizes that indecision can often bring more harm than a wrong decision. He will therefore, not shy away from decision, but will use all his wisdom to make choices that will produce the most harmless direction. 32. If we believe we have no control, we acquiesce our real power, become subject to the decisions of others, and become like a leaf floating helplessly down a current of other people’s decisions. 33. The important thing is to make a decision and move ahead. As you move ahead greater light will come. 34. The great Decider has put us in the game and we must play. 35. Just because we have free will to make careless decisions does not mean that all decisions are a part of the plan. 36. Now consider this – is there any cause without decision? No. Decision is cause – BE-CAUSE. 37. Some feel they can avoid making a decision as if any decision were wrong or all decisions are right. 38. The fact that God’s will and our own is one, does not mean that every decision we make is a wise one; but one thing it does mean is, that it is God’s will that we are forever free to exercise our will and make our own decisions. 39. Whether or not you are kind and considerate has very little to do with your brainpower, but is due to conscious decisions one makes. 40. We may not like all the decisions people make when given freedom to do so but in the end, as water reaches its correct level, the life of the body begins to flow and a beautiful, free living society is the end result. 41. There are decisions made from outside our ring-pass-not that affect our reality over which we have no control. 42. It is written that “ye are gods” and we are in the “image of God.” If this is true and we are true to our destiny then we should wisely make decisions and cause them to come into being. 43. Make a decision to be lead by the spirit within rather than an authority without. 44. The main decision I am referring to, that is even more important than overcoming fear, is the decision to seek soul and spirit, the decision to seek higher light, knowledge and understanding, the decision to love, etc.. To be devoid of fear and yet to not advance in these decisions is to move toward a Zombie state. 45. If we do not direct our destiny through our own decisions, then the decisions of others will control us. 46. 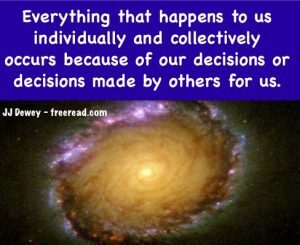 Everything that happens to us individually and collectively occurs because of either our decisions or a decision made by others for us. 47. The decisions that you must make and follow through to completion are just the opposite that most would make in your same circumstances. 48. Our decisions are only made consciously. 49. We are reflections of God and as reflections we make decisions by ourselves. This is the power that is in us. 50. Animals do make some decisions on an elementary level, but to see this you have to put them in a situation where their instincts or programming does not take charge of their actions. 51. That which governs true decision is intelligence and the higher the intelligence the more difficult it is to predict the decisions. 52. Those lesser evolved than us are not 100 percent predictable to us so we are not fully predictable to those above us. DK [Djwhal Khul] said that Christ and the Masters of Wisdom could not predict human decisions. 53. One of the main causes of depression is that we have avoided decisions in our past. 54. God’s Will is in all decisions either through wise choices, or through using our agency to choose. 1 The Keys of Knowledge are centered around revealing principles. 2 When Christ is “in you,” then the Revelation of John will present a Key that will make the path understandable. 3 As far as the first key goes keep in mind that DECISION is the key word but not the key itself. 4 The key note to be repeated more than any other is, “Peace on earth goodwill toward men”. 5 The Christ Consciousness is a key to becoming a knower in the worlds of form as well as the formless worlds. 6 The key for all of us is to follow the “highest that we know,” not the highest that we do not know. 7 The key to true oneness is two people obtaining soul contact. When two look through the eyes of the soul, they see as one. 8 The key word for harmony is ‘acceptance.’ Accept the differences and see the divine at play in each other’s roles. 9 The principle of freedom is a key that must be understood before we can make a conscious decision for the path of light. 10 An important key to staying in harmony with your soul is to make sure that every word you speak is true to the best of your knowledge. 11 There is one earth and one surface of the earth, yet there are billions of seeds that are planted on its surface. Each seed grows into a separate plant entity, yet is still a part of the One Life which is Mother Earth. This is a key to understanding the One and the Many. 12 The circle in spiral motion is the grand key to the universe. 13 The key to telling the truth at all times and fulfilling your promises at all times is the principle of conscious projection. 14 The key to soul contact is to remember that there is a perfect God that is omnipresent and is therefore in our neighbor as well as ourselves. 15 One of the key ingredients to effective person-to-person communication is that those attempting to so communicate use the same definition of words. 16 Another key in unlocking the soul is the demonstration of love to others through service. 17 The key to spiritual healing is to find the center that controls the affected area and send energy to move the blockage if there is congestion or to quiet the energy if there is inflammation. 19 The key to recognizing the Beast in action will be this: You are expected to believe a thing merely because it is proclaimed and the proclamation so made is lacking some facts, twisting others so that it appeals to an emotional sense of what is right. 20 Maximum allowance and tolerance for freedom must become the keynote of both religious and political organizations. 21 The keyword for light is “revelation”: for light is that which reveals. 22 The key is to keep ourselves grounded in the real world by mentally acknowledging the reality of evil, negativity, the Dark Brothers, etc., yet at the same time focusing thought on the desired energy and outcome. 23 We are given the key number for the cities of Zion: 144,000. Each completed city of Zion will have approximately this many heads of households and at least one city has to be underway before Christ will return. 24 One of the keys to overcoming the fear of God is to read the scriptures rather than listening to hellfire preachers, for indeed the Christ, the Master of us all, did present a God that is to be loved and embraced and seeks for the true good will of his/her children. 25 The key to a correct direction of self is to seek the good of the group to which you are a part. 26 Many believe that just being a good loving person and living a good life is the key to being noticed by the Great Ones, but such is not the case. The real quantum leap forward comes when you start asking the why of things. 27 Most of us are stuck with seeing only in this world, but soul contact is the key that opens the door to all higher vision. 28 The key word for the intuition is revelation because the development of this ability opens the door to formless worlds. 29 The New Jerusalem is the key that unlocks the prison bars of matter, and the prison gates are unfolded releasing the central light of the One Living God within. 31 “Never say never” is one of the keynotes of the mid-way point. 32 The third most important key in treading the middle path is to use and share that which is revealed in the midway point. 33 We are entering an age where initiation will be a keynote and those who will be seen as worthy servants will be those who call themselves and initiate beneficial work of some kind through their own free will. 34 The key to the correct use of thoughtforms is non-attachment. 35 From a higher point of vision there is no loss, but that is often of little consolation when we focus on this world we are in. Again, acceptance is key to facing loss. 36 If we were trying to establish the one true religion, or the best of all possible political worlds, or the greatest country in the universe – if these were our keywords, then the perils of separatism would be too great. 37 The key to common sense is to avoid extremism and seek a happy logical place in the Middle. 38 The Trinity of key words representative of the New Age will be Service, Responsibility and Freedom. These three principles can only operate on maximum efficiency through the plane of the mind. 39 A hint to the key to understanding evil and why death is associated with it lies in these two key words: (1) Reversal; and (2) Attention. 40 Remember we are talking about truth as points in time and space. Contemplate what this important phrase means. This is a key to harmonizing all of our thought as a group. 41 One of the later Keys of Knowledge has to do with the principle behind the science of sound which humanity has picked up to an amazing degree in their selection of sounds in portraying certain meanings on the physical plane. 42 The key is to seek with an honest heart to communicate truth as experienced rather than concentrating on the words themselves. 43 The key now is to work together and blend your light. 44 The key is to remember that Israelites are working with the brilliant fire of God that can penetrate all things, and they must become skilled in its use. 45 The key to keeping your marriage vows is not to become so self-sacrificing that you dedicate yourself to a miserable life just so you can keep your word. Instead, the key is to write your own marriage vows in such a way that you can keep them even if your spouse goes off the deep end. 46 The last twelve keys called The Keys of Eternal Life are not to be taught in writing but must be taught in the student-teacher relationship using the intuitive principle. All keys before that time are just preparation for the final keys. 47 As with all principles the second key of judgment must be used to apply them in life. 48 It is only when the seeker releases himself from blind trust and uses the key of judgment that he can choose correctly. 49 The inward voice is the key to peace. 50 If you want to go through a locked door and have the key in your pocket, but do not know you have the key, then you do not effectively have the power to go through the door. There is a way to do anything, but if one does not know the way he does not have the power. 51 Remember that “authority” is the key word or principle behind the power the beast has over humankind not the beast itself. 52 The key to emotional fulfillment is to avoid suppression. 53 The key to mastery is to learn the laws that govern light and dark and use them to make your decisions and dreams come true. 54 If you learn all the keys of knowledge and all the mysteries of the universe, but have no power to decide or to become, what other fate than frustration and disintegration into death can await you? 55 There are three basic keys to happiness in any relationship; they are communication, giving, and trust. 56 The solving of illusion holds the key to placing Maya and Glamour in their right place and not the other way around. 57 The way words sound is not by accident. Here we go to a great mystery. “In the beginning was the Word” and we’re touching on one of the keys of eternal life. 58 The key for the teachers of this age is to present truth in such a way that it gently works its way into the consciousness of the students. 59 The key to not holding a grievance is what we might call the Lion Principle. People and lions are what they are and we should not hate them for being so. We can accept them for what they are but deal with them wisely so no harm will come. 60 The principle of freedom is a mystery just as most principles are. Why? Because it takes a certain degree of consciousness to apply the second key of judgment to understand and apply it. 61 The way to achievement in honesty and the keeping of our word among us human beings, as it is done in the kingdom of heaven, is an important key and the path is not as you may have been taught. 62 Make the words of life themselves your meat and drink. How this is done is one of the keys of eternal life leading to the overcoming of death. 63 Eternal words, or words that do not pass away, are the key to communion. 64 The keys I teach are not just keys for me. They are universal keys that will benefit all who receive them. Just like the answer of 2+2=4 is an answer that all can use in their life. 65 There is a revelation behind a full understanding of each of the keys [of knowledge]. What Are You Deciding To Become? 2 When the seeker says he has found the ultimate feeling, bliss, or God Presence, he knows not that he is only at the beginning of his journey. No matter how high the consciousness, bliss or joy, the seeker adjusts to it and eventually becomes ready for more. When he is ready, the more will come, worlds without end. 3 Additional seeking is always necessary no matter where we think we are upon the Path. There is always more BECOMING ahead of us. 4 BECOMING is the action of Purpose, the dominating good which interpenetrates both male and female energies. 5 Unfortunately the word BEING is associated by many with the decision “not to be” as spoken by Shakespeare. True BEING is not yielding to the line of least resistance but after we have taken “arms against a sea of troubles,” and have prevailed as Gods – only then will true BEING become known and no longer esoteric to us. 6 We are in a state of eternal becoming because there is no ultimate perfection. 7 He, who humbles himself before those greater than himself and before those seeking the light from his radiance, will be endowed with the glory of God from on High and generations unborn will yet warm themselves with his light and love. 8 Let us join the great ones together, my friends, and humble ourselves; so any greatness which is manifest is from the one Spirit that permeates us all. 9 “Being yourself,” for many of us, involves recognizing that we have a purpose for being here. Our obligation–our opportunity–is to discern what that purpose is, and then surrender to whatever it requires of us to fulfill. It can be a source of deep joy: service to humanity, in whatever form, is deeply satisfying. 10 Part of being humble is just being you. 12 We only go forward on the path by amplifying our power to decide in harmony with the Will of God and then bring that decision into reality through BECOMING. 13 God works through each of us and BECOMES who He decides to be through us so long as we follow the Spirit of God within each of our inner selves. 14 Incorporated in BECOMING is BEING. 15 In order to become, one first must be, or become alive. Becoming only increases the sense of being alive. 18 Those who live upon the sea of hateful and bitter emotions despise the good, the beautiful and the true. They die as to the things of the Spirit. 19 Greatness is seen in worldly power and money rather than in spiritual power, intelligence and character. 20 Many of those who fight the truth of the soul will be stolen and taken away by the spirit of Christ and removed from their illusions. 21 To become the greatest possible help to others who are under negative influence, it is important to develop your sensitivity to the feelings (and sometimes thoughts) of those within your aura of concern. 22 As an individual you can, through the soul, contact the spiritual worlds and your own higher self, which is a Master upon its own plane. 23 How does the Beast of unjust authority want you to see yourself: as I AM, standing still – easy to control, or I AM BECOMING, changing and improving and therefore difficult to control? 24 All activity that one can engage in is pushing toward the fulfillment of a conscious intelligent goal set by someone somewhere. 25 If one wants to accomplish beyond the norm he must not only believe but make a decision within his ring of consciousness. 26 A goal is a specific believable objective set by the mind and accepted by the heart. It includes definite steps that will be taken to ensure its completion at an approximated time. 27 We can become a member of the heavenly Jerusalem at any moment that we “overcome” and obtain soul contact and the Christ consciousness. 28 The principles that just are cannot be altered or changed but must be mastered and used to mold creation to a desired end. That desired end is that which we DECIDE and creates the process of BECOMING. 29 When we realize that we are BECOMING beings, we discover the truth and the truth sets us free. Free to do what? Free to DECIDE for ourselves and BECOME that which we decide to become. 30 The path for us to become one with God and manifest the name within is us for us to take upon ourselves the name of Jesus Christ by committing ourselves to the highest service that we know and then practice the science of BECOMING the highest that you can DECIDE to BECOME. 31 It is only after a decision has been made that Purpose is made manifest even though they both silently co-exist in the mind of the Creator. Then it is only after a purpose is sensed that Power can be applied. Again it is only after purpose and power is in play that Will can be exercised to manifest the decision. 32 You may receive inspiration, knowledge and some guidance, but your own power of discernment and DECISION will always play a large part in how you will apply yourself. 33 We begin to win at the game of life when our ATTENTION is focused in one direction rather than scattered. 34 Put your attention on finding that which is true rather than that which is in error. 35 Any denial of that which is true, leads to greater failures than those experienced by one who faces the truth of failure and perseveres in learning from it and turning it into success. 36 The mirror of ourselves is always out there in the world of our creation. I seek to help you create a more loving world to reflect back to you. 37 To become a Master one must not only balance off cause and effect as it relates to others, but also as it relates to oneself and between the lower and higher self. 38 When the heart and mind are in agreement (as was Jesus and the Christ) then there is peace and harmony and miracles happen in your life. 39 I caught a glimpse of the suffering humans experience on the earth, and I saw much of it happens because people just don’t take the course of action they know within their hearts they are supposed to do. 40 If you look for verification of something that you have a preconceived notion is true, then you will find evidence to prove it, at least to yourself. This will happen whether the notion is true or false. 41 The Still Small Voice is the revelation of “Direction.” It is fortunate for humanity that the use of this requires no great spiritual evolution. The only real requirement is that a seeker seeks that which he understands as the guidance of God. He must do so with sincerity of heart and pure intent. 42 When God switched from the state of Being to BECOMING, the worlds of form were created. 43 My conscience is a perfect man whom I would like to see. 44 If we can attain a true realization that we are truly a reflection of the Solar Angel, and one life with it, then we can become as Christ and have power over physical reality and even death. 45 Keep checking with your souls, and when the link called in the east the antahkarana is created, then the seeker graduates from a sheep to a disciple to a shepherd. 46 As you double your ability to achieve, your opportunity to use other people’s energy and efforts will multiply geometrically. 47 If you are a light to the world and light is produced by contrast would this not indicate that you should live a life that appears in sharp contrast to average “Joe six pack”? 48 Without fear there is no courage and without courage there is no point of tension and with no point of tension there are no quantum leaps into newness and great adventures. 49 Seek ye therefore the baptism of fire and the Holy Spirit, the greatest of the gifts of God in this life. 50 All who follow the highest they know will join with the higher consciousness and share a oneness with them and assist in the great work. 51 If the seeker follows the direction of the peace that passes understanding then he will be led to true vision. 52 When you make a decision around some goal of becoming that decision relates to what you will be in a future time or what you shall become. 53 Contemplate the part of you that actually decides and you can feel that link between you and God. It uses your bodies but it is not your bodies. 54 What are you deciding to become? Posted in Book of QuotesTagged antahkarana, becoming, being, Christ consciousness, Decision, indecision, perfection, quotations, quotesLeave a Comment on What Are You Deciding To Become? 1 You are not your body, you are not your feelings and you are not your mind or thoughts. What are you? You are that power within that can make a decision from which purpose and potential power reside and from which all things spring. 2 We decide because of what we are and we BECOME because of what we are. 3 I use my uniqueness to see for Him which is myself. 4 Whatever we create is a creation for which God is responsible for man and God are one. We are His hands. 5 How can being one with God be anything else than being God? 6 How can one believe in the omnipresence of God and not believe that God is within us? What do such people think – that God is everywhere but in us? 7 Just as the eternal part of you is the idea of you in the mind of God, even so the eternal part of light and love are the idea of them within God. 8 The whole physical body consists of the dense physical that all of us see, plus the normally invisible etheric. The etheric is composed of millions of lines of force joining and merging to give the dense physical a coherent form. 9 We could define instinct as reliable computer programs that have been placed by the Creator into our vehicles [bodies] for the purpose of insuring our survival. These little programs are always correct in their original context and worked well for primitive humanity, but in more complex situations they are often misleading. 10 The fact is that when one is given a job, and the job is accepted, it becomes a matter of pride to do a good job, even if the job turns out to be disgusting. 11 When a normal human being sees and understands what is right, he will normally follow it. 12 The equality of the human race, as far has having basic needs met and equal opportunity offered, is planted in all human souls and is an ideal that will someday be manifest. 13 All of us are deluded to some degree in one area or another. 14 Do not overlook your own uniqueness and that your slant on things is often more interesting than you think. 15 We are all composite beings made of many lesser lives and to maintain the cohesive force to keep the lower lives together to maintain the higher, attention must be focused on the higher energies of soul. Without this attention and the drawing forth of spiritual power then the forces holding the lesser lives becomes diminished until, eventually, the lesser lives come apart and return to their native element. This produces a death or disintegration of the person as they are. 16 Unfortunately it is rare to find even one person who is this open minded as an adult. Most who do see themselves as open will shut down as soon as some truth crosses their path that does not align with their mindset. 17 The very fact that we are here in a place of risk illustrates that deep within the souls of us all is a greater desire to be free and to explore and to BECOME than to just be still, stagnate and safe. 18 If God and man are one, then man is God and God is man. We only seem to be two because we have been deceived into thinking it. 19 Five entities in the Bible have called men Gods. They are the serpent in the garden, the God of the Old Testament, Moses, David, and Jesus. 20 The eternal part of ourselves, or divine intelligence, has no cause but is cause and has no beginning or end. 21 Whether the self is complete [or not] we have to define what complete is. Some selves are complete idiots. 22 We are ideas in the mind of God. 23 The monad is our originating point in this universe and beyond this point is the mystery of our timeless past. 24 That which makes you a human unit existed for eternity in the mind of God as a human intelligence. You were not an idea for an atom, a plant, or an animal, but the song which is you is a human song. 25 As humans we are not the highest but neither are we the lowest. 26 We are a part of the body of the Source; as such we are the source of ourselves. 27 We are unborn eternal individual units each with our own differing purposes. 28 The real you is not three parts but one part using numerous vehicles. When we are done with the vehicles we do not fuse them together but discard them, taking only with us the intelligence they provided. 29 You are a reflection of your Solar Angel and are nourished by it. 30 If we are in tune with the Spirit of God we can tune into the smaller lives within our body and catch a glimpse of smaller units of consciousness than we ever dreamed possible. 31 The possibilities of mankind will be revealed in outer form through technology as a forerunner to the full revelation of the inner powers. 32 The five lower chakras and hundreds of other smaller energy points are actually little lives that were once animals and other little lives eons ago. 33 People today are attracted to the safety of the status quo and strong personalities more than ideas. 34 Another interesting person of more recent historical note who got himself in trouble and eventually killed for teaching the Godhood of man was the Mormon prophet, Joseph Smith. 35 God creates through His imagination just as we create through ours. Just as our imagination is unlimited so is His, but neither are infinite. There is always an end to what any being imagines, but no limit. 36 When condemnation subsides, the son of man becomes the Son of God and the Father recognizes another beloved Son who has found himself. 37 Cause is initiated and directed by intelligence and purpose through the power of Decision, which is the core of what we are. 38 We exist or live to have experience. 39 You as an individual are going through an experience unique to yourself, slightly different from any other life in the Universe. 40 Human beings are the soul of the universe. 41 Just as you have soul within your physical body that creates and gives you form, even so man is the soul energy within the great body of the universe and has a destiny to create the great body of God on a universal scale. 42 There is a higher part of ourselves that is like Christ and has the Christ consciousness. 43 Our bodies are not who we are. Instead they are vehicles that we use. A person giving his body to another for a higher use can be a great act of free will. 44 You as an individual entity consists of a musical chord of four notes at any given point in time and space. Your physical body vibrates on a certain note as well as does your emotions and your mind. Then your soul vibrates on a fourth note. You also play your notes in a certain key. The four notes are predicated on the worlds of form. Three correspond to the physical, astral and mental. The fourth is a synthesis of the three corresponding to the whole personality. 45 The first great purpose of man is to discover and use the intelligence behind the great forms that have already been completed in the microcosm and apply that knowledge to the macrocosm. 47 Your whole body is a hierarchy of atoms and molecules with the permanent atom at its head recreating the great power of organization necessary to create your physical structure. This feat is greater than we can imagine.